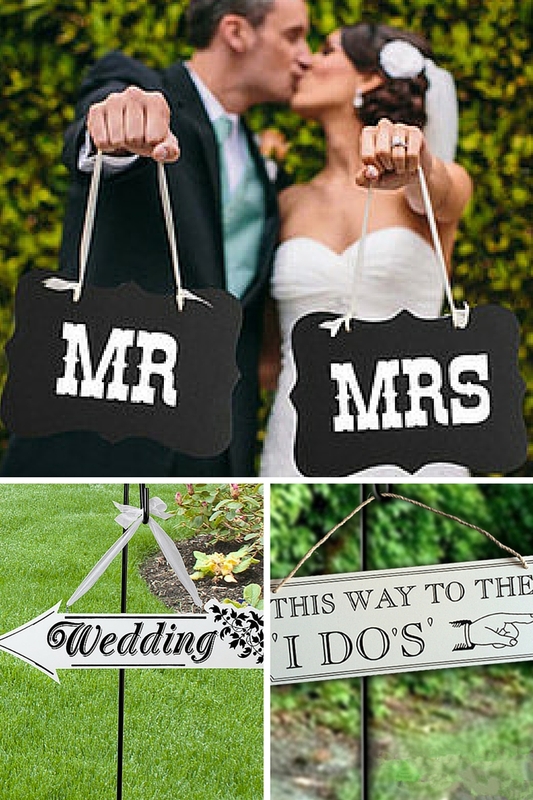 A very popular trend today is to guide and advise our guests using wedding signs and wedding sayings on chalkboards The number of wedding receptions signs ideas are huge and it sometimes can get quite overwhelming trying to get it down to a simple few that you need. There are also funny wedding sayings for signs which are used widely in photographs for props. You can start with just the simple wedding signs on wood which the wording is already printed on for you and are easy and less time consuming for those who don't have a lot of time left to DIY. These are easy to either hang on to a shepherds hook into the ground, over a chair or nail to a fence or gate. There are also chalkboards which come in lots of various sizes. You can add your wedding sayings on chalkboards by using larger boards for bigger and bolder or smaller boards for props in your wedding photos or to advise your guests to help themselves to wedding favours or to sign the wedding guestbook. * "Happily Ever After Begins Here"
* "Today, Two Families Become One, So Pick A Seat Not A Side"
* "This Way To The "I Do's""
* " The Party Starts Here"
* "Welcome To Our Happily Ever After"
* "Mr Right, Mrs Always Right"
* "Today Is The First Day Of Our Forever"
* "It Was Always You"
* "This Way To Love, Laughter & Happily Ever After"
* "Love Is Sweet, Take a Treat"